In response to yesterday's Curse of the Confederate Cannibals entry which I tweeted to Lloyd Kaufman, the legend himself retweeted me and then shot over this YouTube detailing the Japan portion of shooting The Toxic Avenger Part II (1989). I feel like I'm not worthy of even that much effort, haha, but the least I can do is post that video here on this lowly blog and instruct you to support Reel Independence! Also FYI, much like the first film's Japanese cut (which recently had its DVD debut), its sequel also had a unique Japanese version, only this time with scenes shot on-location in the country. This 102 minute version is only available in North America in the out-of-print Tox Box DVD set and on Japanese VHS and DVD (both in English). The separate U.S. "Director's Cut" discs and tapes are the shorter edit. I've always respected what Kaufman has done ever since my first exposure to Troma-related content with The Toxic Crusaders as a kid. 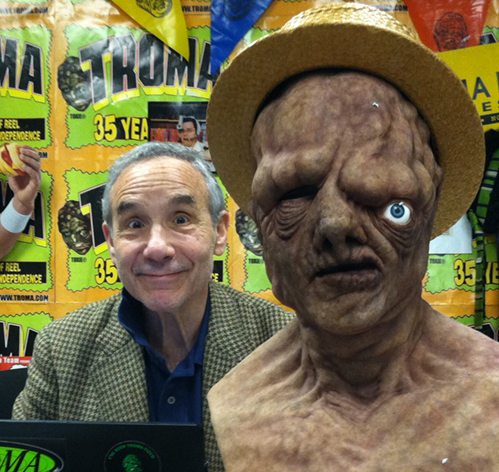 Well, maybe not quite that early on, but after getting old enough to watch and read up on all that Troma has managed to accomplish since its inception and still be kicking on so little, it's pretty damn awe-inspiring. Not to mention, through all the self-deprecation and shameless promotion, Kaufmann seems like a genuinely nice, hardworking guy. It also helps the Troma distributed Redneck Zombies (1987) is one of my favorite movies in existence and I thank them every night for bringing it to the masses (okay, perhaps not every night).